Our Posi 300 automatically affixes pressure sensitive labels to the top and/or bottom of flexible packages, rigid modified atmosphere trays, boxes, and a wide variety of finished products. 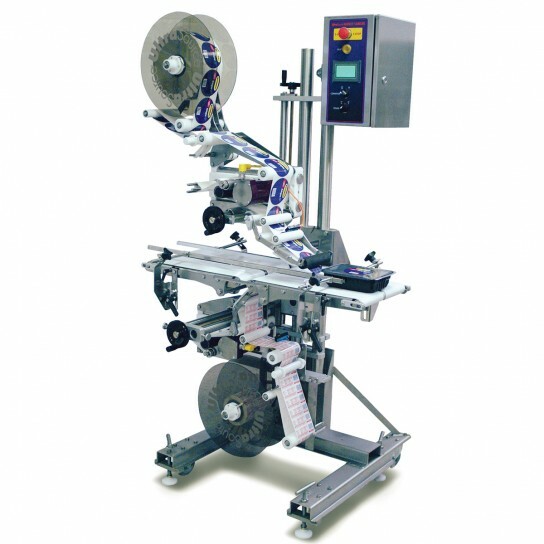 Posi 300 is well suited for in line labeling applications fed directly from food packaging machines and can be configured for either left to right or right to left operation. - User friendly NEMA 4 rated touch screen controls include graphics to illustrate operator parameters. Stores up to 26 product programs. - Self guiding 12” wide split conveyor belt is designed to transport products up to 17” wide. No need for alignment adjustments to end rollers. - Low energy consumption (220VAC draws less than 4 Amps; 110VAC draws less than 8 Amps) - Locking casters and levelers - Designed, programmed and built by UltraSource in the USA!